I went to Kyotofu in Hell’s Kitchen on a recent afternoon with a friend for lunch. 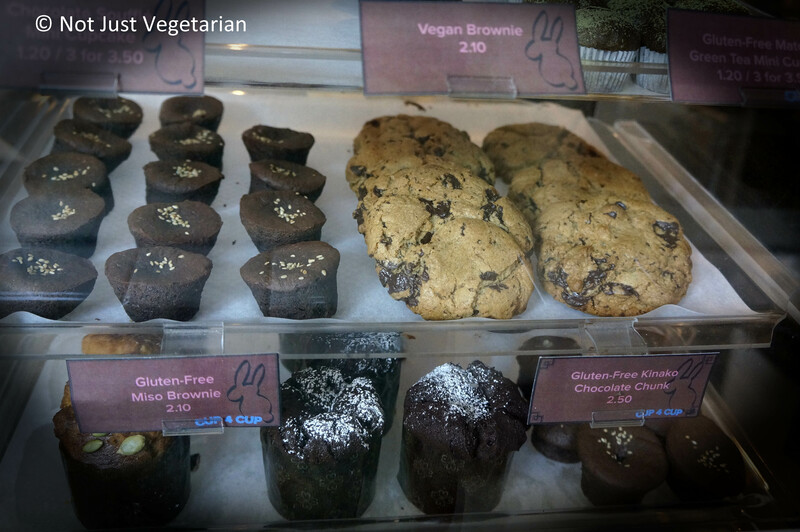 I had heard so much about the vegan desserts and the tofu based dishes and they all tasted great – it’s a shame that I have not been there in the almost 7 years that it has been open in NYC. Kyotofu’s website says that it’s a “modern Japanese dining and dessert destination”. I got to try Kyotofu’s genmai toasted rice shortbread cookie, when I was at Dean & Deluca a few weeks ago, so I just had to have lunch or dinner at Kyotofu and was delighted when a friend of mine wanted to go there too. Kyotofu is not listed on OpenTable, so you need to reserve a table through the restaurant’s website and I thought it was nice that Founder Michael Berl replied directly to reservation request. My friend is vegetarian and does not mind eating vegan dishes, but prefers certain dishes with dairy e.g., some dishes that traditionally include dairy, e.g., mac & cheese, and panna cotta etc., need to do so. Between us, we got the house-made tofu, mac & cheese, and curry rice, and the sweet potato cake. Overall, it was an amazing meal and I plan to go back there for more. 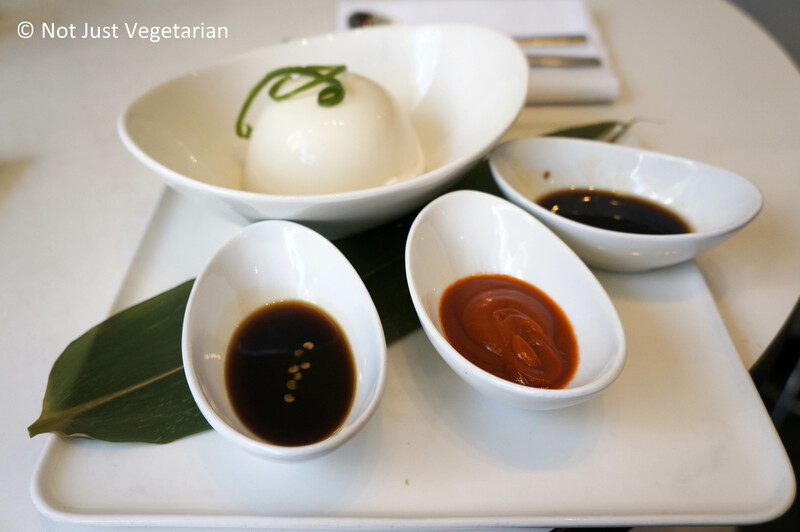 The house-made tofu (served cold) arrived with three sauces. I have usually seen house-made tofu served with different salts or just soy sauce in other restaurants in NYC . At Kyotofu, the tofu was served with sesame-soy sauce, tomato olive oil sauce, and kuromitsu (something dark and sweet). My friend and I are sesame lovers and loved the tofu with the savory sesame soy sauce. The tofu was very fresh and was easy to eat by itself. The tomato olive oil sauce was great, and would have been perfect with pasta, but not with tofu. We are not averse to creative combinations, but we feel that certain things are best in their traditional combinations. Tomato olive oil is simply too Mediterranean to enjoy whole-heartedly with tofu. We did not care much for the kuromitsu either. The mac and cheese was a small portion, but perfect. It had some shichimi (Japanese seven spice powder that is added on rice / noodle dishes) on it that gave it a slight kick. The gruyere in the mac and cheese added weight, truffle pate added aroma and the panko (Japanese style breadcrumbs – per this Chow post) on top gave it great texture. It’s kind of strange to eat mac & cheese at a modern Japanese restaurant, but when we ate it, it felt that it was worth ordering. 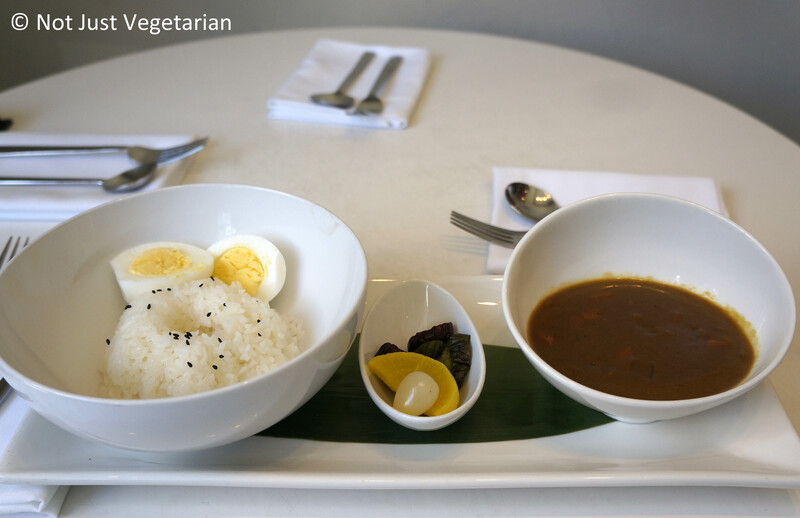 The curry rice was served as a bowl of rice with some black sesame seeds, a hard-boiled egg, and a curry sauce with vegetables. Somehow I had imagined the curry rice to be a serving of rice cooked with curry powder and turmeric similar to the way Singapore rice noodles are made. At Kyotofu, the curry sauce with vegetables tasted of some cinnamon, turmeric, cloves, ginger etc. – very much the spices that one would associate with Indian food. We had read and heard so much about the desserts, that we wanted to get a dessert. When we asked the server for her recommendation, she said well the warm chocolate mochi cake, and the signature sweet tofu (panna cotta) are pretty popular (I bet the warm chocolate cake and the panna cotta are popular at any restaurant!!!). We did not want a tofu panna cotta (traditionally made with heavy cream / milk, would be absurd with tofu – or so we thought). My friend was keen to try the sweet potato cake that came with sweet potato caramel, spiced pecans and creme fraiche. I am not a sweet potato fan, so I did not expect much from this dish. 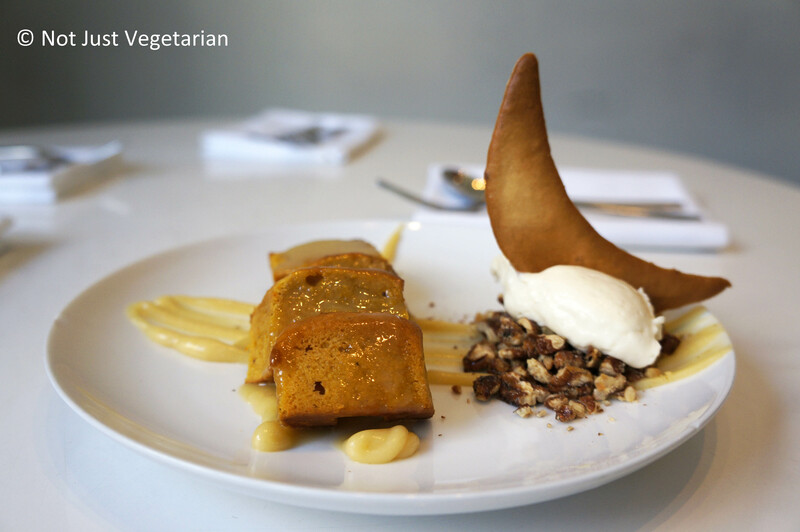 This was simply the most amazing sweet potato cake one could have. I could not stop eating this cake. The cake arrived as a few small sliced pieces of sweet potato cake in a rich golden brown color, topped with caramel. The cake was warm and moist and not too sweet, but the caramel and the caramel made up for the lack of sweetness. The creme fraiche added a nice refreshing touch that only fresh cream can add, and the spiced pecans added a great crunchy texture. I am now tempted to try the sweet potato cake if it is ever on the menu in another restaurant. 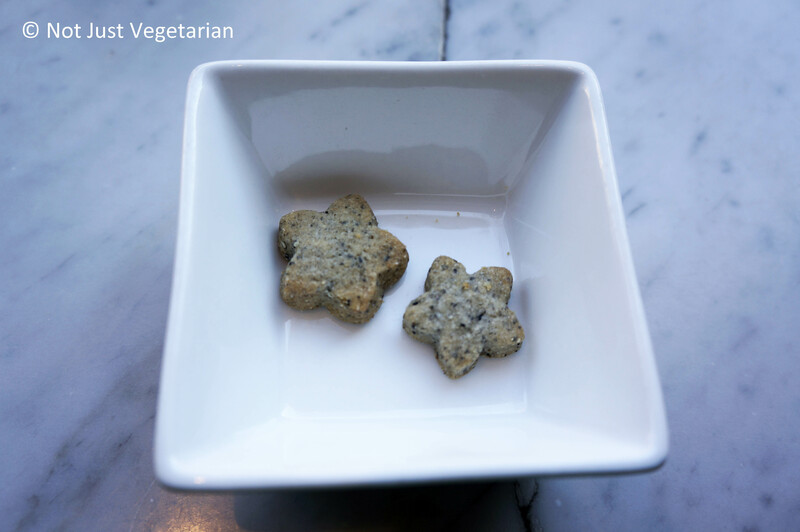 We got a couple of black sesame shortbread (gluten-free) cookies on the house. As I mentioned before, I love black sesame, so I loved these black sesame short bread cookies, but my friend preferred the sweet potato cake. Why would you go to Kyotofu? 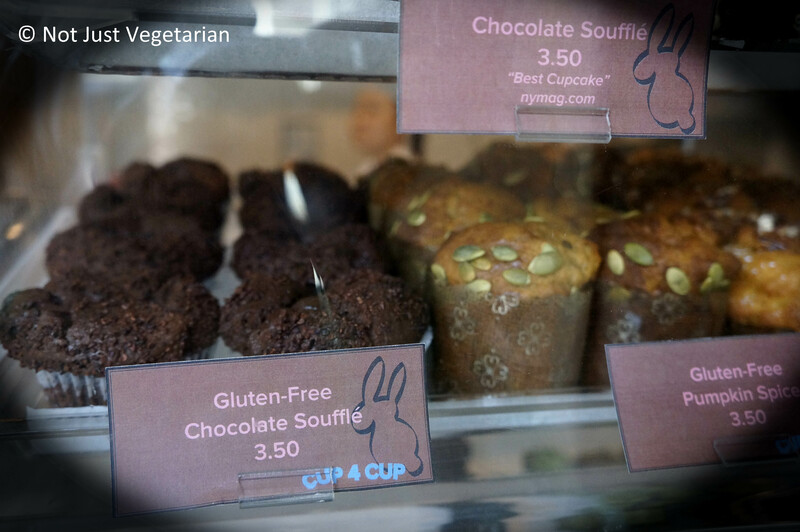 It has the best sweet potato cake in NYC. The food is delicious and will make you want to return for more. There were many other dishes that were vegan / vegetarian. 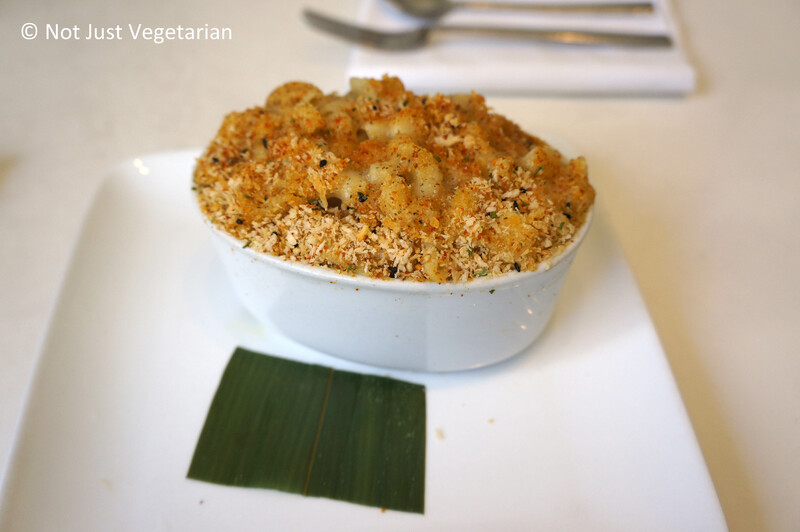 The menu conveniently lists dishes as vegan, vegetarian, and gluten-free.